In the case of the Abu Dhabi Court of Appeals vacated the Court of First Instance’s decision. The appellee was ordered to pay the appellant’s court fees and costs incurred at both stages of proceedings, as well as AED 500 in advocate’s fees. In the case of [please insert case name/number], the Abu Dhabi Court of Appeals vacated the Court of First Instance’s decision. The appellee was ordered to pay the appellant’s court fees and costs incurred at both stages of proceedings, as well as AED 500 in advocate’s fees. 2. In the case at hand, the process intended for service upon the Appellant (a corporate entity) was instead served directly upon one of its staff rather than on its legal representative or any other person acting on its behalf. This was held to be a violation of Article 9(2). The Court of Appeal ruled that a process (or summons, or claim), should not be served on a member of staff except in the absence of the Company’s legal representative or any person(s) acting on that company’s behalf. The Court of Appeal also found that the name of the employee who had refused service was not identified. 3. Importantly, pursuant to Articles 10 and 13 of the Code of Civil Procedure, the Court of Appeal ruled that because the claim was not issued on appropriate party for the purpose of service, any prior proceedings and decisions rendered therein were void. 4. The Court of Appeal found that the purpose of service of the claim had not been achieved because the Appellant did not receive notice of the decision and consequently did not know it was required to appear before the Court of First Instance. 5. 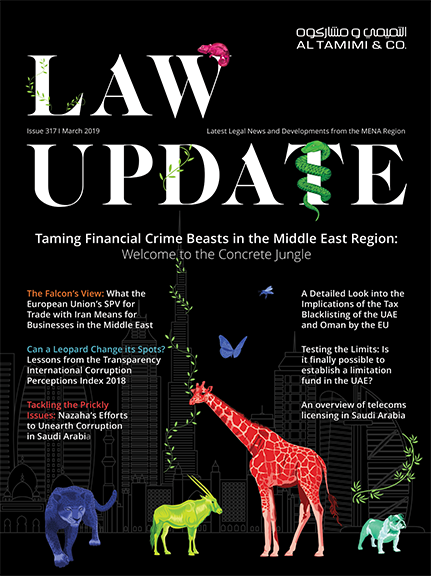 It is important to note that consistent with well-established UAE case law, the Court of Appeal held that it had jurisdiction to review the case on matters of law, only, and that it was not at liberty to review matters of fact. That is to say, while the merits of the case are unreviewable at the Appeal stage, the application of law by the lower court may still be reviewed. The Civil Procedure Code (Federal Law No. 11 of 1992), as amended, sets out the prescribed procedure for service and clearly enumerates the particulars that should be included in the notice document. The Code establishes important principles for lack of service and effecting service by posting or publication in Articles 5 – 9. This is under pain of service being declared void pursuant to Articles 10 and 13. In addition to providing, in Article 7, the requirements for a document to be sufficient for the purposes of giving notice, the Code then explains the method of service in Article 8. A copy of the process should be personally delivered to the individual intended to be served or delivered at his domicile or place of work. The process may also be served at a place of that individual’s choosing. However, it should be noted that notice need not be served at the defendant’s residence or place of work; notice is suitable if “delivered to the person to be notified wherever he may be” (Article 8(2)). When the person to whom notice is addressed cannot be located, Article 8(3) provides alternative measures to ensure adequate service of process. Given such specific courses of action, service of process is not, in my opinion, open to interpretation, rather, is grounded firmly in the text of the Code. Article 8(4) seems to act as a clause of last resort, when there is no individual capable or agreeable, upon whom notice may be properly served. In such case, the person undertaking service must refer the matter to the judge who can then direct that a copy of the process be posted on the notice board and on the door of the place of residence of the person to be served.. Furthermore, if the court verifies that notice cannot be served on the defendant because he has no known domicile or place of work, under Article 8(6), the judge may effect notice by publication in an Arabic language daily newspaper, simultaneously serving adequate notice to the defendant while confirming that the plaintiff has duly performed his duties pursuant to the law. In our opinion there should absolutely not be a clause appearing on the notification document stating that the process server is entitled to serve by posting in the event that he does not find anyone eligible to be served or in the event that the intended recipient/ addressee or one of his staff refuses to receive service of process. That is because such an action by the court, if it were to leave place, would violate the explicit provision that obligates the process server to present the matter to the judge so that the latter may order service by posting or publication. It is clear from the foregoing that service by posting on the notices board and at the defendant’s last known address are allowable, pursuant to a court decision following an unsuccessful attempt to personally serve the defendant or defendant’s agent where the process server cannot find anyone capable of accepting service from among those listed in Article 8(2). Article 8 permits service by posting notice on designated notices boards, and by publication in newspapers under Article 8(4) and 8(6) respectively. On the other hand, there is no provision in Article 9 allowing service by posting or publication. This is a very important issue of great significance for many cases, as shown by the Court of Appeals’ present decision. Article 9 deals with service for UAE ministries and their departments as well as companies, associations, private establishments and all corporate entities. Under Article 9(1), notice must be served upon the legal representative of the state ministry, or federal or local government departments to be served. Article 9(2) outlines methods of service of process on companies, associations, private establishments and all private corporate entities. A copy of the notice document is to be served at the company, association, private establishment or private corporate entity’s headquarters, upon its legal representative or any other person acting in his behalf. A company’s legal representative is authorized to legally represent the company before third parties either as the chairman of its board of directors or on the basis of a mandate duly authorised by the general manager, CEO or appointed managing director with the right to delegate his right of representation to third parties. Accordingly, when suing any of the corporate entities mentioned in Article 9(2), a specific individual must be named as their representative. Article 9(2) then states that if no representative or person acting for the corporate entity is available, a copy of the notice document should be served on employee, such as the office manager or the secretary, after verifying his identity and recording such service on both copies of the notice document. Finally, Article 9(2) concludes with the following provision: “If [the company] has no administrative headquarters, the copy shall be delivered to its representative in person or at his domicile.” This highlights the special importance given to service on private corporate entities, including companies and establishments, which is prescribed for them under pain of the service being declared void. There is often confusion as to the applicability of the provisions of Articles 8 and 9 in different circumstances. Because of such misapprehension, Article 8 tends to be applied to all types of defendants, including companies (as opposed to private individuals) as shown in the present case at hand at level of the Court of First Instance. Lastly, as far as nullity is concerned, Article 10 of the Code of Civil Procedure provides that notice comes into effect at the time the copy is served in accordance with the provisions. This means that if the copy is not served in accordance with Articles 8 and 9, notification shall be without effect and rendered absolutely null. Article 13 deals with irregular procedure. It is a general provision concerning all procedures under the Law. The second part of the article reads: “Notwithstanding any provision to the contrary nullity shall not be declared insofar as the object of the procedure has been realised.” Article 13 seems to be in contention with Article 10, which is a clause on its own, as well as one which relies on several others (denoted by the fact that Article 10 is satisfies only if service of process is made “in accordance with” other articles within the Code). It follows that if, despite irregular process in terms of form or required details within the notice document or method of service, the person to be served appears in court in time to enter his defence, the object of the procedure would be realised and nullity will not be declared with respect to service. However, such a waiver of nullity does not seem to extend to all circumstances; if, despite provisions for nullity of process, the person to be served appears in court after the pleadings are closed but is not allowed to stand before it and enter his defence in the case, his appearance would not realise the object of the procedure and irregular process may be asserted by the defendant, requiring that the court declare null the service of process.